Quite hard to tell from this image but it looks like a light pink colour and should look pretty good against the purple Shanghai courts. 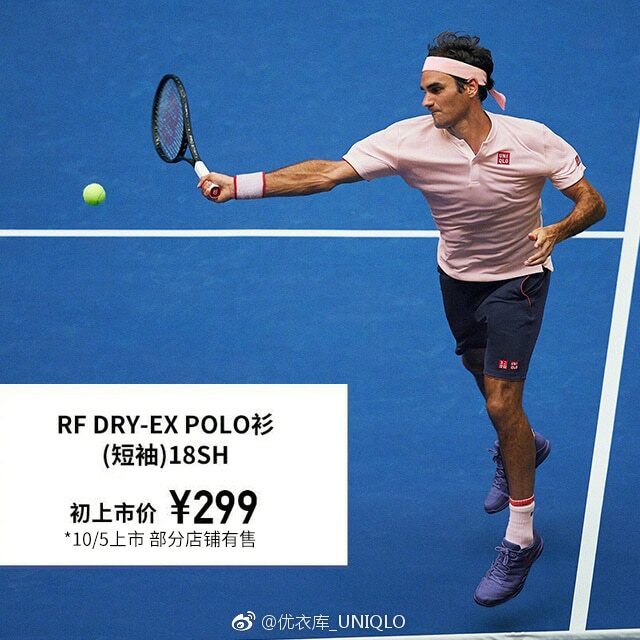 Design wise it's very similar to the previous Uniqlo outfits and it seems like their product cycles are wayyyy longer than Nike's; as a result, we'll see Roger wearing only slight variants of the same product for the foreseeable future. Finally, I hope Uniqlo up their online game next year starting at the Australian Open. They are missing out on a ton of e-commerce business by not listing these items for sale or having them up for pre-order. Hey, Nakul and you weren’t there even after I posted! Still hate the red square, though. Second ! I love the pink girly colour… it reminds me of another light pink Nike shirt à few years ago. I found it. He wore a nice light pink shirt at Cinci 2010… and it brought him luck as he won his 63rd title there against Mardy Fish ! Go, the pink pantherer ! I never like the piping down the middle on that design. Looked like a shirt or something. The 2010 shirt could be Rodney Dangerfield…the regular guy look. Fingers crossed the shirt will breathe or else Roger won’t. Roger looks good in almost any color. Only thing is I miss the RF logo! Be interesting to see if he ever does use it and how Uniqlo incorporate it…. Hi Jonathan! Looking forward to see Roger on court….I like the pink, like Cec mentioned, Roger looks good in almost any color. Me too, been a while since USO loss now, already in Japan I see, Shanghai draw this week. First off, love the grey sweater with the white shirt. Seems like Uniqlo will come up with boring and plain shirts. No pattern ever? I wonder if it’s thick and stretchy? Yes, miss the RF logo. And the red squares are too big. BUT, I’m sure Roger will look great as usual. Godsick talking the “R” word. Enjoy while we can! Saw a photo of Fed in the pasta aisle today at the local grocery store. He was drizzling oil on some pasta. I don’t think he knows how to boil an egg. Yes, enjoy – and fear the R-day. Well Roger said during LC that he didn’t want to retire. Kind of nice promise! ? When asked if he was a good cook, Roger replied that he is a good eater. I think that says it all. What about the white jeans / chinos? Love the white jeans but didn’t want to come off as sexist. Thanks Jonathan for another valuable contribution. He hasn’t won a tournament wearing Uniqlo yet, so not a good switch yet IMO! Overall I prefer the Nike stuff he’s worn in recent years than anything Uniqlo have put out so far, but I don’t mind them. I like it. I just need Rog to hv a good Autumn swing as points dropping and ranking needs to hold!! Roger be number one seed and Djokovic two? Roger will 1 seed and Novak 2. That’s because Roger has 2,100 points from 2017. Novak will likely be the year end number 1. He’s only 1,000~ points behind Rafa, who’s not going to add too much points considering his knees and Indoor/Hard being his weaker environment. Roger has a slim chance and Delpo is also in the mix. Thanks for that.Yes the year ending number one looks like being a close run thing? Roger looked good in uniqlo clothes based from pictures taken in Tokyo. Looking like a model omgggg…. delicioussss. Uniqlo got to up their game by introducing pre-order sets for upcoming kit not when the tournament that has been over more than 2 months! Design wise, more variety not just solid colors even though it looks nice on Roger. Lastly as what Jon commented, yet to win any tourney since wearing Uniqlo, do we need to hire shaman or witch doctor to break the duck?? Yeah I’m surprised they don’t sell them online, I have no idea on how many Federer tops Nike sold but it’s definitely going to be a few. I couldn’t tell you where my nearest Uniqlo store is, probably London. So how do I get one if I want one? I am on a train coming back from Geneva for business… Not a single ad for the Sept. 2019 Laver Cup in the city yet … What a shame 🙂 (I’m kidding). Geneva who said what a beautiful city it is.So I would love to go but the expense is daunting. he lives on Lake Zurich,what a pity its not lake Geneva? I meant for the 2 coffees at 8 euros.. I live in Geneva, and yeah it’s expensive! Just hope the sweat licking properties of this Uniqlo gear is upto the mark. The USO experience (not just Fed but also Kei) kind of gave Uniqlo a bad rep.
Fed looks good in pink. In mostly everything, really. And yes, like all of you, waiting for the first trophy in Uniqlo. ? Even he was sweating buckets in his Uniqlo! I saw Kei putting the collar up and off his neck. He usually seems to be a guy who looks less hot and bothered on court. I know the heat was uncomfortable for everybody, but there was an article at Deadspin where the writer specifically mentioned the Kei and Uniqlo (and Roger) and the heat factor. Yeah, the not being able to buy online thing really hurts them globaly. Feels like a waste of Federer because I doubt even the most ardent fans will travel across the country to get the outfit especially. I know a lot of high end merchandise and what have you in Japan goes up for pre order online and then ships after that period ends, but afterwards typically isn’t available to just buy online without a huge markup price. Maybe something like that would work for Federer – that way the e-commerce thing wouldn’t ruin their physical retail strategy too much (as the only way to actually pick them up on a whim is by visiting one of their stores) and fans of Federer will have a chance to get the stuff they want as long as they order while pre orders are open. Not a perfect solution but I think it’d work out as something of a middle ground. Seems like a few players have effectively ended their season early. I know I was previously advocating for Fed to shut his down (which I’m starting to walk back because the length of time between matches has been rough as is), but I’m not sure I love it as a trend, it feels like we’ll eventually get to a point where the season will basically end in September. Maybe I’m looking to much into it but it feels like more and more players are focusing on the big big events a lot more than previously. Maybe it’s just because the average top player now seems to be in their 30’s. Please read this. Fantastic Roger ! Main draw ceremony is tomorrow Oct. 6 Saturday local time at 10:30am. Roget might start vs Medvedev / followed by Rublev / 1/4F vs Nishikori / 1/2F vs DelPotro…. Feds Kryptomite in the semis? Nike don’t seem to be selling this particular colour variation (dark blue with red logos) of the Vapor X Zoom shoes either. Shame, I really like them. That pink colour looks the same as when you forget a red sock in the middle of your whites when doing laundry. And yes, I don’t think that UNIQLO are capitalizing on this Federer deal.. yet.